Order from chaos. In every specific duty a firefighter performs - this is the goal - order from chaos. Whether the call is for a heart attack, house fire, car wreck, hazmat spill, SIDS, high-rise fire, heroin overdose, shooting, stabbing, child abuse victim, respiratory distress, building collapse or any other event in which we roll up to, we are to bring order from chaos. And we are charged with giving all in this pursuit. In 1894, Spokane had its first line-of-duty death. Captain George T. Chapman died when an aerial ladder collapsed, plummeting him to the ground. He was the first of many firefighters to die in the service of Spokane. With the death of our own John Knighten on June 30th, we brother and sister firefighters find ourselves in the chaos of loss, along with John's wife Shawna, his three daughters - Kiley, Kasey and Ashley, friends and his entire family. John died from a three-year fight with multiple myeloma - one of the few cancers that has been proven to be a presumptive firefighter cause of death in Washington State firefighters. Since 1987, there have been 18 presumptive firefighter cancer deaths, overall, in Washington. Don Waller, a Spokane fire lieutenant, has been president of Local 29, the Spokane firefighters' union, for just over 6 months. He says that although saying goodbye to one of your own may be the hardest things we will ever have to do, firefighters are practiced in this hardship in that "we go on medical calls and deaths of relatives, friends, coworkers, little kids and treat patients who may be in the similar circumstances as your mom or yourself." In Spokane, many of us have had the unfortunate honor of stopping the flow of blood from a gunshot wound, giving CPR, starting IVs, providing medication and intubation, defibrillating and then realizing that the person who is dying in our hands is a friend, a former boss, coworker, or a relative. That same guy you knew from a niece's or nephew's birthday party is now your patient. You may watch the life drain out of him, no matter what intervention you make. As a firefighter, you try to be the best thing for a person on the worst day of his or her life. And sometimes, you come up short. Making that phone call to your brother-in-law to tell him of his brother's death, at three in the morning, will be forever etched in your memory. Firefighters prepare for and try to be ready for any emergency at any time. This is one reason why every city (except recently Spokane) in the nation brings a big fire truck on every call. Likewise, firefighter organizations work hard to ensure firefighters are able to do their jobs for the citizens they serve. Waller noted that the three organizations Spokane firefighters are affiliated with - Local 29, the Washington State Council of Fire Fighters and the International Association of Fire Fighters are all actively involved in researching better ways to improve firefighter health - both physically and mentally. Spearheading cancer research, educating firefighters on toxins, pushing for better equipment and more expeditious ways to provide citizens service - Waller says firefighters' unions are leading the charge. These gains and tools will eventually help the entire community. One of the tools which firefighters use to manage just about every major incident, is not really a tool but a way of organizing and perhaps could even be seen as a ritual. Birthed out of wild land firefighting, the Incident Command System (ICS) is a method to help structure and transform chaos into order. With specific duties, language, levels of command, functional and geographic delineation of duties, the ICS is used on almost every call a firefighter responds to, and has even been adopted by the military. John Knighten's funeral, which was preplanned by John, his family, the union and the department will use volunteers from all over Washington State who are experts in their specific ICS duties - for example, the media liaison for John's funeral is a Spokane Valley firefighter. Subduing chaos into order via the ICS brings predictability and a small level of comfort to new, stressful circumstances into which we firefighters daily encounter. A component to of Monday's memorial is the Spokane Fire Department Honor Guard - a joint venture between the fire department and Local 29. And where the military has borrowed ICS from the fire service, the honor guard borrows heavily from traditional military honor guard rituals. Kevin Haughton, the Spokane Fire Department Honor Guard Commander says that, since it's inception, seven years ago, the honor guard has been providing professional, formal displays of dedication to the fire service in many arenas. This will be the first time they will provide services for a line-of-duty death for a City of Spokane firefighter. When asked how that will be, providing honor guard service for one of our own, Kevin replied, "Very tough." He reminded me, that the service and the ritual is not just for firefighters, but will provide comfort to John's family and loved ones, as well. 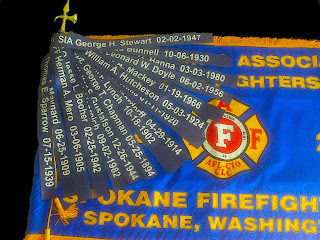 During the memorial service, the Spokane Fire Department Honor Guard will present the colors of the Local 29 flag. Atop this flag rests 16 line-of-duty-death streamers, each bearing the name of a Spokane firefighter who has died in the name of Spokane, a person once charged with bringing order to chaos - keeping a city sound, stable and productive. On Monday, Local 29 President Don Waller will place John Knighten's name atop the flag, joining all the others who have, over the last 119 years, paid the ultimate sacrifice. Don will place it there for all of us, John's brother and sister firefighters, John's family, his friends and for you - the citizens of Spokane. Rest in peace John. 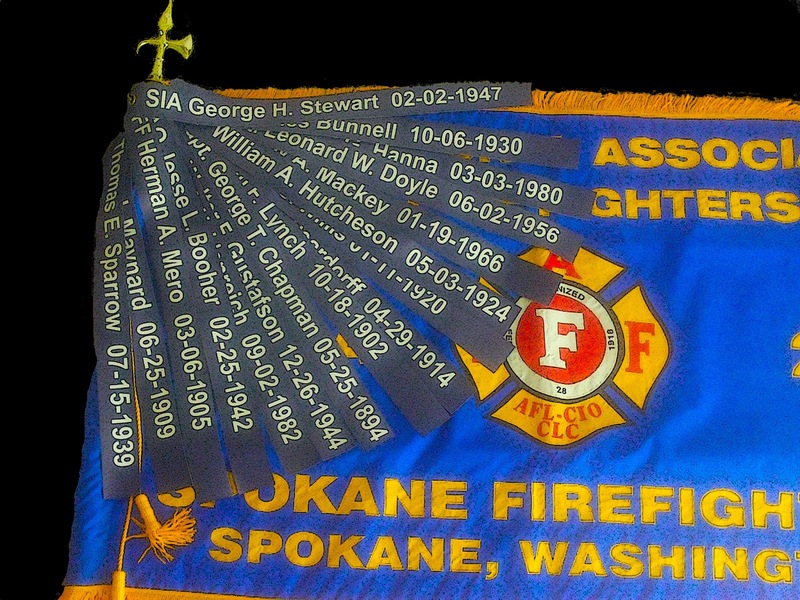 For more information on Spokane Firefighter Line of Duty Deaths, visit here. If you are wondering why a firefighter was using the homeowner's garden hose on this fire, it's because the city shut down Engine 9, this neighborhood's fire engine, one that has been there for over 100 years. There is only a two-person rescue truck at Station 9, now. It has no water or hoses. It was the first fire department vehicle there. So, all a firefighter could do was use the garden hose until fire engines arrived. It was a little while before any got there. Narrative:The Spokane City Fire Dept. 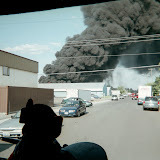 dispatched firefighting crews and their apparatus to 917 W 16th Ave at 15:22 hrs on Saturday afternoon, June 29th, to a reported structure fire at that address. Rescue 9, from the neighborhood fire station located at 18th and Bernard, was the first apparatus to arrive on scene. The officer on that apparatus reported that there was a 2 story wood/frame residence with smoke showing from the peak of the roof. Upon hearing that initial report the responding South Battalion Chief radioed the Fire Dispatch Center and requested that the fire call be up-graded to a “working fire”. This up-grade would add an additional fire apparatus to the incident. As fire crews began arriving on scene they were assigned to various tasks which included initial fire attack, a back-up hose line to protect the crew already going inside to attack the fire, a secondary fire attack lead, water supply, a ladder crew to go to the roof to evaluate the status of the roof structure, another ladder crew to enter the structure to begin pulling down the ceiling in a second floor bedroom and to start covering the contents of the home with water-proof tarps, a Scene Safety Officer was assigned, and the mandated RIT (Rapid Intervention Team) was established for any needed rescue of a lost or down fire fighter. Fortunately there was no one at the home at the time of the fire. The coordinated work done by the fire crews on scene resulted in a quick knock-down of the fire which was located in the attic of the structure. Crews remained on scene for nearly three hours overhauling the scene and searching for any signs of hidden fire. There were no reports of injuries to any of the fire fighters at the scene. The building sustained heavy fire damage to a small portion of the attic and to the ceiling in one second floor bedroom that had to be opened by fire fighters so they could get at the fire burning above them. The cause of this fire was investigated by the Spokane City Fire Dept.’s Special Investigation Unit and the initial report, based on eye witness accounts and visual indicators found in the tall pine trees surrounding the structure, was determined to be a lightning strike. Four engines, two senior ladders, one heavy rescue truck, and two Command Vehicles delivered 23 fire fighters to this incident. Cause:Lightning strike traveling down two tall pine trees that had branches touching the roof of the house. Damage:Small area of the attic, ceiling in a second floor bedroom. AMR to standby for any injury that could occur.